If you're researching a lawyer for a medical malpractice case in DC - here’s what you should require of a DC Medical Malpractice Lawyer. At Donahoe Kearney, we will give you information to help you on your case, even if we don’t represent you. One of our core values is that we serve the community of those injured by a medical mistake. Even if you have a small case you may need and do deserve help, and we will put some free materials in your hand to help you get a leg up. That’s exactly why Frank Kearney wrote a book on patient safety: “Patient’s Guide to Med Mal.” It’s because you deserve to know how the sytem works - trust me,the doctor, hospital, or HMO do. That’s also why we'd like to give you our free attorney evaluation form. It’s because you may not know everything you need to look for; and we want to help you find the right lawyer for you and your family. If you hire an attorney for a serious medical malpractice case, you need to make sure it’s the right one. Sometimes we get a call from somebody who has had an attorney for two years and the attorney screwed up their case becaue he didn't have the experience needed to help... Most of the time when another attorney has been handling the case for so long it’s too late to fix it. 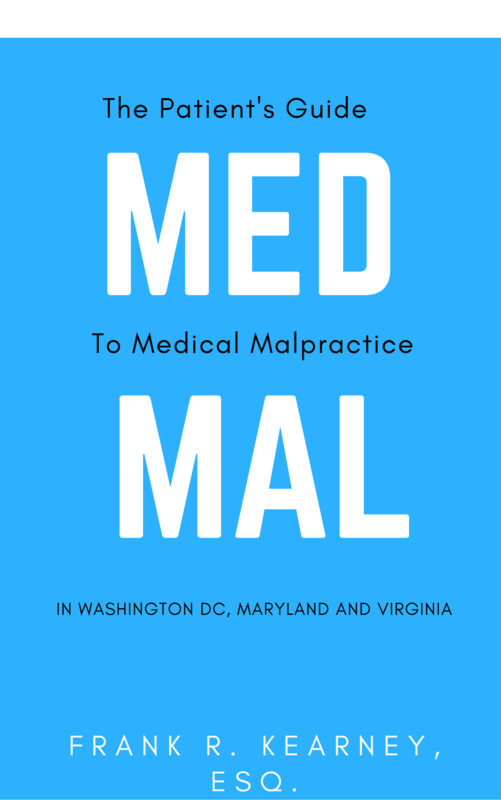 So make sure you use your evaluation form to find out if the lawyer you want to hire really has the qualifications and resources to handle a specialized medical malpractice case in DC. But let me tell you a little secret here right off the bat: at Donahoe Kearney, we want to listen to your story.